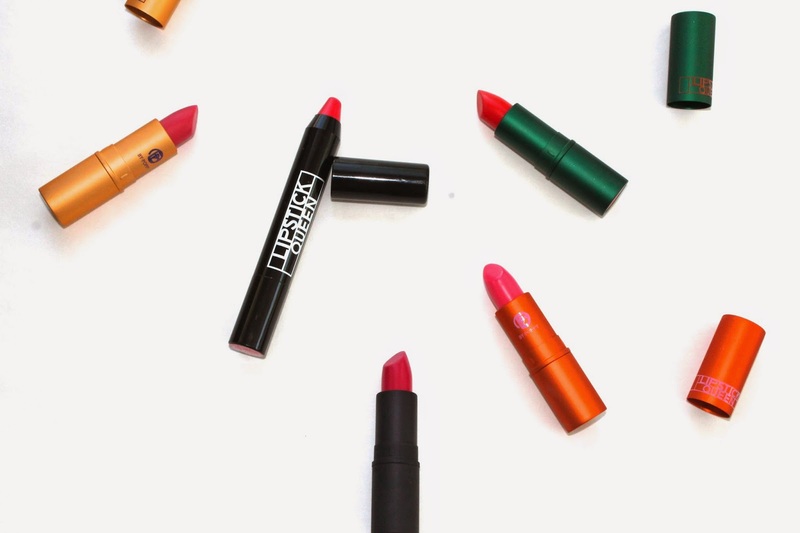 I recently went a little crazy with in Space NK and bought a handful of Lipstick Queen lipsticks. I have heard such good things about this brand and wanted to try a few different lipsticks. I picked up the newly released Jungle Queen (green packaging), which is a sheer-ish orange, red shade. It looks great on the lips and is the perfect red for the summer time. Then I had to get the Endless Summer (orange packaging) lipstick in Perfect Wave. It is an amazing pinky coral shade that just screams my name. And, of course, I had to pick up one Sinner and one Saint. Sinner is 90% pigmentation and Saint is 10% pigmentation. For Sinner (black packaging) I bought Hot Rose which is a bright rosy pink shade that is crazy opaque on the lips. For Saint (gold packaging) I bought Bright Rose. It is similar to Hot Rose just more sheer and a bit more on the rosy side then the pink side. And lastly I had to get on the Chinatown Glossy Pencils. I love me a chubby stick. I picked up Chase which is a nice sheer red shade. The only thing I don’t think about this is the fact that it isn’t a twist up. It comes with a pencil sharpener but, I would totally love it more if it twisted up. Now lets talk packaging. The packaging on these is just so amazing how could you pass these up. The Perfect Wave packaging is my favorite. It totally reminds me of California. 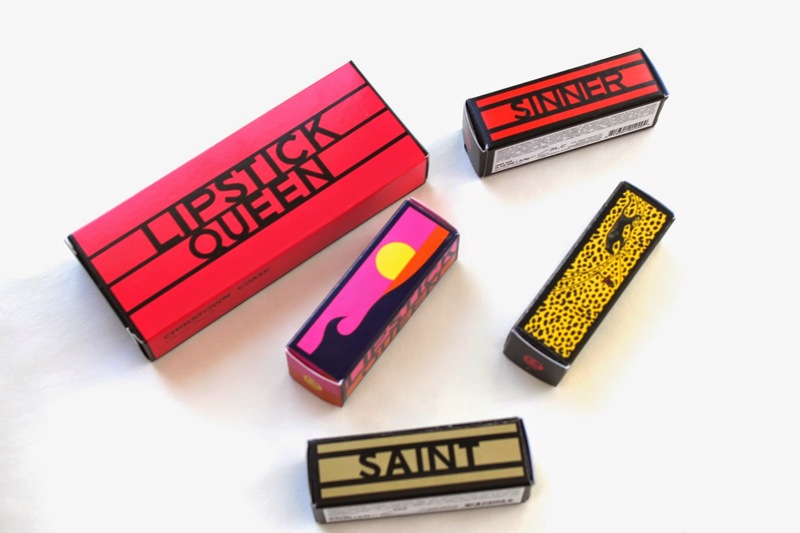 And the lipstick tubes themselves are ultra sleek. The lastly power is also amazing. The Sinner lasts the longest but, I believe that is because it is much more pigmented then the rest. The rest are on the more sheer side. They last about 2 or 3 hours depending on my eating/drinking situation. And they are so moisturizing. I hate when I wear a lipstick and about an hour in my lips are so parched and I need to apply a tube of chap stick to make them feel better. These lipsticks are the totally opposite. My lips feel fully moisturized. Even when wearing the Sinner my lips feel great. Overall I am really loving this brand. I will totally be picking up some more shades, especially of the Sinner and Saints. 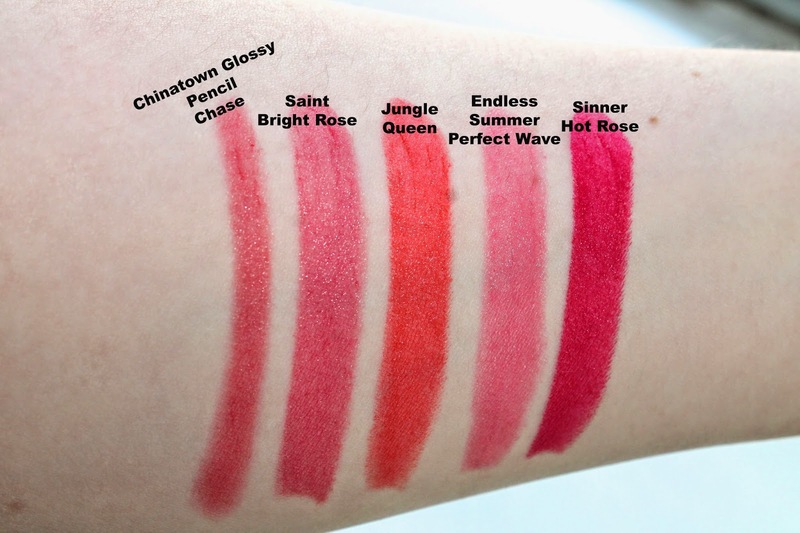 Have you tried any Lipstick Queen products ?? What did you think of them ?? oh my goodness that hot rose shade!! LOVE!! isn't it gorge !!! thanks for reading !! !